Most companies’ managers and HR managers are constantly looking for freelance developers to work with them part time or full time jobs. 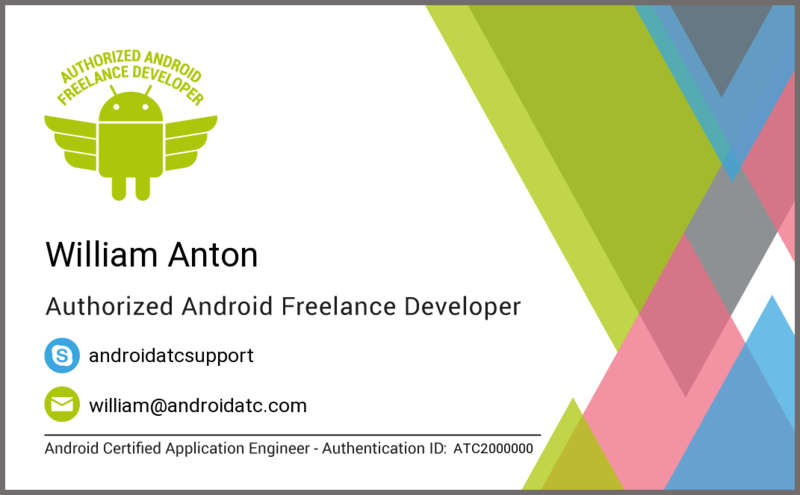 The Android freelance business card is a great way to help you market yourself, especially when you publish your Android freelance developer business card on your LinkedIn profile and your social media accounts. Thus creating an opportunity for you to perhaps acquire an overseas contact and/ or other people may share your card, therefore; helping you make new worldwide connections.You may use only your Skype and email addresses as contact information to receive emails from the public, where most people don't like to publish their telephone numbers for different reasons. To request your freelance developer business card, you must have the Android certified application engineer certificate, which means you must have passed the three exams AND-801, AND-802 & AND-803. We need to check that you are not a Robot?